Maintaining an appropriate ambient temperature is crucial to the proper functioning and longevity of your material handling equipment. But, with the arctic weather making it’s way across the United States, it’s important to start thinking about crane and operator safety in cold weather. Using lift equipment can be hazardous on a good day, but when freezing temperatures and heavy snowfall are introduced, operator safety becomes even more important. Furthermore, there may be ways to “weatherize” your overhead crane system for some of your cold-weather applications. According to OSHA 1926.1417: Extremely cold weather conditions can have an impact on crane and lifting operations. Cold weather influences the use of cranes, hoists, and rigging devices at 32 degrees—freezing. When the temperature drops below 10 degrees, appropriate consideration should be given to crane hydraulics, and the possible derating of the crane. Reading applicable safety standards and consulting with a qualified mechanical engineer, reputable dealer, or crane manufacturer, can help you to take all the right steps to weatherize your system. However, in the meantime, we can provide you with some advice that is easy to incorporate and will protect your crane—and its operators—from cold weather degradation. So, what type of material can endure cold weather without fracturing, bending, or shattering? High-strength, low-allow steel. High-strength low-alloy (HSLA) steels are designed to provide better mechanical properties and/or greater resistance to atmospheric corrosion than conventional carbon steels. Many overhead cranes use steel track that’s rolled from ASTM A572, A607, or A715 grade steel to ensure the high-strength, low-alloy compositional ingredients necessary to endure difficult environments. And, high-strength steel can be finished with powder epoxy, or galvanized coatings for additional protection. Steel track, beams, and other components can be specially weatherized to withstand temperatures as low as -70 degrees, making these systems ideal for cold-weather operations. There are tons of protective finishes on the market, but these two are the most common, and they seem to do the trick in cold weather environments: two-component epoxy coating, and hot dip galvanizing. Two-component epoxy coating is the system of choice in many critical industrial coating applications. Two part epoxy coatings were developed for heavy-duty service on steel, but they use less energy than heat-cured powder coatings. The epoxy finish is extremely hard and resistant to friction. It also provides optimum protection against particle abrasion, corrosive fluids, turbulence, heat, cold, and impact forces. Hot dip galvanizing, on the other hand, is best used for applications near salt water or for extremely corrosive applications. It can also protect steel beams and other crane components from cold weather exposure. Galvanized steel is reliable and extremely effective. In the galvanizing process, steel is coated with zinc to protect it from corrosion. Hot dip galvanizing provides thick, durable corrosion protection, and it can be applied rapidly—offsite and under controlled conditions. One basic way to ensure your overhead crane system is protected from debris and ice is by opting for an enclosed track system. Enclosed track systems are designed using a “V” shaped profile, which guides the trolley within a defined path and protects it from environmental factors like debris and ice. The self-cleaning V-shape also maintains wheel alignment for end tucks and trolleys, so they always glide effortlessly, day after day. Using a trolley that doesn’t get jammed from exposure to frozen weather reduces a worker’s risk of injury and greatly improves productivity. Furthermore, most manufactures offer steel wheels for trolleys and end trucks, which can easily withstand cold weather exposure. When the temperature drops below freezing or you’re forced to operate motorized lift systems in cold weather, another thing to consider is electrification systems. Festoon cable systems are used to manage cables and hoses that provide power to moveable machinery. These are a perfect solution for indoor applications or for outdoor operations in normal weather. But, for cold or freezing temperatures, consider conductor bar systems to protect your electrical components. Conductor Bar Systems are an excellent alternative to box track festooning, especially where cold weather is a concern. Conductor bar sections are formed from galvanized steel or electrolytic copper. These systems are amply sized and proportioned to carry the specified current without overheating. The high-strength, low-alloy galvanized steel can act as a precautionary measure; ensuring frigid weather doesn’t make a mess of your electrical components. Conductor joints can also be made from galvanized steel to safely keep the conductor bar sections aligned during installation—even in cold climates. They are also used to insulate joints and guard against accidental contact, debris, and ice or snow. 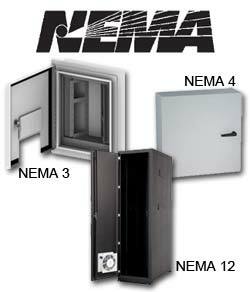 The NEMA rating system is defined by the National Electrical Manufacturer Association, and frequently signifies a fixed enclosure’s ability to withstand certain environmental conditions. NEMA has listed three ratings in particular, which were developed for outdoor use and are designed to protect against weather and environmental factors. The following NEMA ratings are most effective for inclement weather or external ice formation: NEMA 3, NEMA 3R, NEMA 3S, and NEMA 3X. So, what else can you do to protect you material handling system? We’ve given you options for high-strength steel, enclosed track, steel wheels for trolleys, two-coat epoxy and galvanization for added protection, electrification and NEMA enclosures…what’s left? 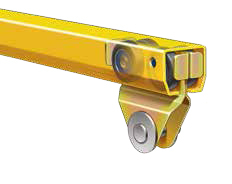 Hoists, trolleys, and crane components can be offered with special cold temperature steels, heated control enclosures, gear box heaters, artic-duty motors, low-temperature lubricants, special material certification, material traceability reports, NDT of load bearing welds, and certificate of suitability for arctic duty (includes minimum temperature rating). Speak to your qualified dealer about purchasing a crane with any of these components or meet with a mechanical engineer to discuss further options. ASME HST-2-1999 Performance Standard for Manually Operated Chain Hoists: Hoists and trolleys covered by this Standard are intended for industrial use in ambient temperatures from 0° to 130°F. 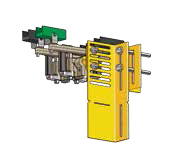 ASME HST-1-1999 Performance Standard for Electric Chain Hoists: Hoist equipment is designed to operate in ambient temperatures between 0° F and 104°F. 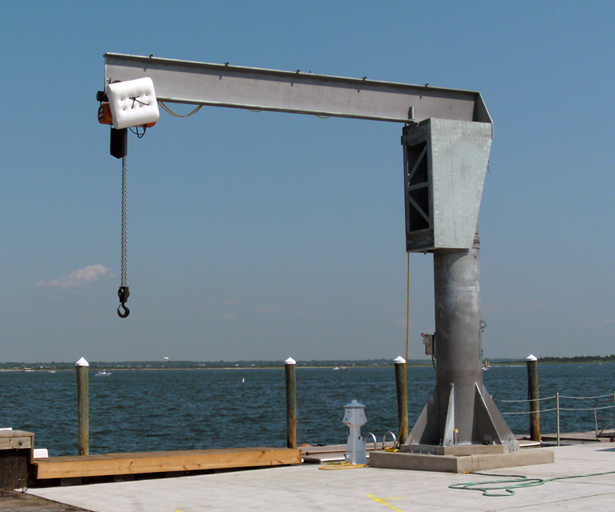 ASME B30.20 Below the Hook Lifting Devices: Additional considerations need to be taken if the working temperature is outside the range of 24° to 150°F. In fact, ASME actually suggests that qualified engineers should either de-rate the crane capacity or use steel that is better suited for low temperature service to protect against system failure in cold-weather climates. But, in the meantime, you can always follow some of our suggestions (outinlined above) on how to weatherize your current overhead crane system, and reach out to your crane manufacturer or reputable dealer for additional information.